More than 1,000 young people from charter schools and communities throughout the Bay Area sought to fulfill the Olympic Creed as they participated in the Bullis Charter School Invitational Junior Olympics June 8. The daylong event was held at Stanford University’s Cobb Track and Angell Field. ￼￼￼￼￼The eight charter schools that participated included: Bullis Charter School (Los Altos, K­6), Charter School of Morgan Hill (K­8), Escuela Popular Accelerated Family Learning (San Jose, K­4), KIPP Heartwood Academy (San Jose, 5­8), Livermore Valley Charter School (K­8), Making Waves Academy (Richmond, 5), Rocketship Education (San Jose, K­3) and Voices­ College Bound Language Academy (San Jose, K­1). Local Olympians and athletes, including Susan Jones Roy, a swimmer in the 1968 Olympic Games; Nancy Lippe, a member of the 1980 U.S. Olympic field hockey team; Kerry McCoy, a wrestler in the 2000 and 2004 Olympic Games; Sara Lowe, a synchronized swimmer in the 2004 Olympic Games; Matt Gentry, a Canadian wrestler in the 2008 Olympic Games; Vic Moreno, a wrestler and 2008 Olympic Trials qualifier; Michael Mitchell, a wrestler and coach at Stanford University; and Courtenay Stewart, a synchronized swimmer for Stanford University, encouraged the young participants and awarded medals to the winners. “We are so excited to have the opportunity to partner with our fellow charter schools in an event that will reach beyond our individual school classrooms and communities to give our students a new athletic and character­ building experience,” said Wanny Hersey, principal and superintendent of Bullis Charter School (BCS) of her decision to spearhead this event. Hersey noted that BCS reached out to charter schools located within reasonable proximity to one another in order to facilitate coordination. Seeking to echo the traditions of the International Olympic Games, the students participated in an opening ceremony. 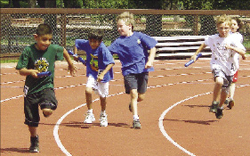 The program featured individual track events and relays, standard field events and contests geared toward the youngest children. The charter schools weaved information about the Olympic tradition into their curricula while offering athletic training in preparation for the field day. At BCS, for example, some third­ to sixth­ grade students participated in an elective class that researched the history of the Olympics. At KIPP Heartwood Academy, students prepared for the individual athletic events, and studied the history of the Olympics and of Ancient Greece, said Mr. David Walton, physical education coach. In keeping with the Olympic spirit of fellowship, the BCS Invitational Jr. Olympics awarded medals not only to individuals in all of the track and field events but also presented a medal to the school that demonstrated the best sportsmanship. The coaches of the participating schools selected Bullis Charter School for its work initiating the event. Hersey and the other charter school principals said they hope the BCS Olympics is the beginning of a tradition for years to come. As for the work involved in coordinating the daylong program with the participation of eight charter schools that had not collaborated in this manner previously, Hersey was undaunted.